In New Hampshire yesterday, New Jersey Governor Chris Christie repeated to voters that he did not hug President Obama after Hurricane Sandy. 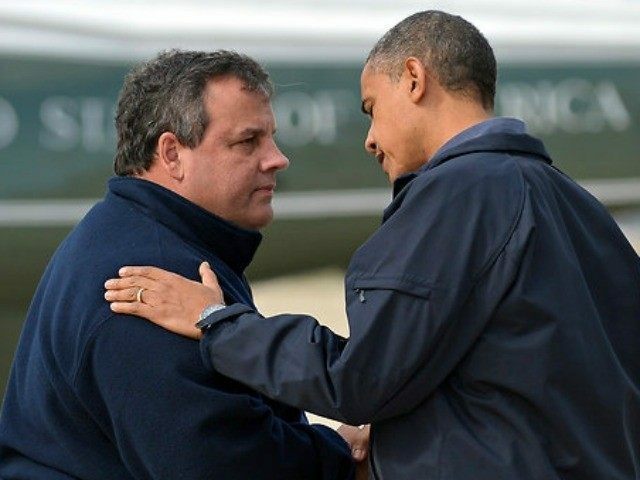 The New Jersey governor has worked for years to dispel the notion that he hugged Obama when the president came to New Jersey – even though conservatives were infuriated that he rhetorically embraced the president when he visited the damage in his state caused by Hurricane Sandy. In 2013, Christie also denied hugging the president – he shook Obama’s hand after he landed at the airport and Obama put his hand on the governor’s shoulder. Other photos online featuring the pair of leaders appearing chummy together, are from Sept. 4, 2011 in the aftermath of Hurricane Irene – a year before the controversy surrounding Hurricane Sandy. In August of last year, Fox News anchor Greta Van Susteren apologized to Christie for reporting that he hugged Obama. “You know I looked at it last night and I said, that’s no hug and I gotta say I’m sorry about the hug,” she said in an interview with Christie admitting it was a rare apology from a member of the media.